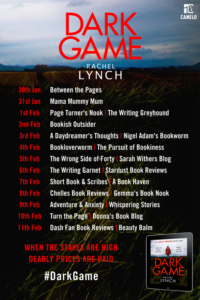 Welcome to my stop on the blog tour for Dark Game by Rachel Lynch. Thank you to Ellie Pilcher for the place on the tour. 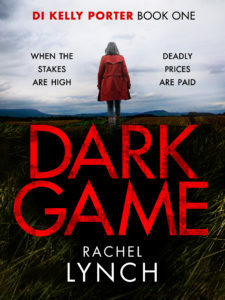 I have a guest post from Rachel to share with you today, but first let’s see what the book is about. Don’t miss this taut and gripping debut from a crime writer to watch. Perfect for fans for Carol Dwyer, Patricia Gibney and Angela Marsons. I remember having a poem included in a college magazine when I was eighteen and it made me feel a huge sense of accomplishment. I can’t even remember what it was called, but I think it was loosely about teenage angst and sitting in a field contemplating the world. Writing for me has been like an old teddy; it’s been forgotten now and again, but I’ve always gone back to it, and it’s always waited. Working in a high street bank at sixteen just didn’t cut it for me and so I left to take A’levels and it’s the best thing I ever did. I studied English and History and I devoured books. I discovered Maya Angelou, JD Salinger, Primo Levi, Chaucer and Shakespeare. Having gained an A grade in both I then began a combined degree at the University of Liverpool. Happy times. The teddy got put away. I started work and moved to London (a bit like Kelly). It wasn’t until about ten years later-around 2005- that I decided to start writing. I wrote short stories and articles. I was shortlisted for a competition and had an article rejected by History Today. I carried on regardless and enjoyed it, but then I took the momentous step of producing a few kids and they kind of got in the way of getting up in the morning, never mind pushing out books. I’d also married into the army (a bit like the mob but not as well paid) and by the time the kids were toddlers, we’d moved six times. I was an expert in brown boxes and holding dinner parties. 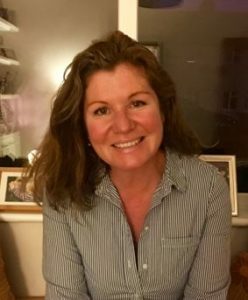 When my husband took a job in the British Embassy in Buenos Aires, it was too big an opportunity to let go: I couldn’t work, the kids were in school by now, and one day I sat down and began to write a story about being an army wife. It was eventually called The Dependants (the army term for a spouse) and followed three wives as they coped with their husbands being deployed to Afghanistan for seven months. I had first-hand experience of this and it was cathartic to write. I sent it off to scores of agents and had a lot of feedback but it was considered not commercial enough. That’s when I began to understand rejection and how common it is in this industry. I carried on regardless and wrote two more novels. One about the army in Germany (a ghost story), and the other about a teacher in London facing racial hatred in her community. I sent everything off to agents but still couldn’t get one interested. The Argentine experience came to an end and I decided that I wanted to write full time. Despite not having an agent, I loved doing it; it was as simple as that. Without an agent, The Dependants was published in 2014, but I made a promise to myself that I wouldn’t publish anything else until I found an agent. Then I turned to crime. It was Peter Buckman from The Ampersand Agency. We met and talked about Kelly and the Lake District for around three hours. Nothing has progressed my attitude or my writing style more than meeting Peter. On 22nd May 2017, he called me to tell me of the Canelo deal. I think I squealed a little. The journey might have started a long time ago, in an English classroom with teachers who we called by their first names (thank you Mark Millar and Peter Needham), and it’s gone over many hurdles, but to go over hurdles you have to go forward, and that’s exactly what I continue to aspire to. I hope readers warm to Kelly Porter like I do, and I hope they want to read the whole series. She’s got a lot more cases to investigate. What a lovely story, Rachel. Thank you!